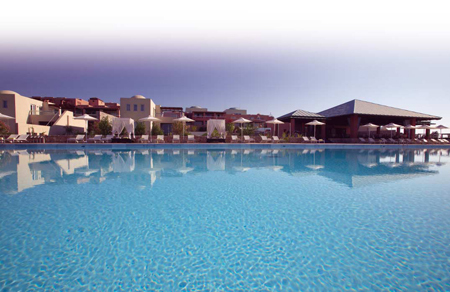 DoubleTree by Hilton Helona nests on the southern shore of Kos Island, overlooking the beautiful “Helona beach” and the volcanic island Nissyros. The resort’s most striking highlights are its impressive architecture, the amazing view and the 21 infinity pools.Water flows from one pool into the other creating a natural melody and allowing the wet element to reach the façade of the rooms. The domes and cobbled alleys bear allusions to the ancient palaces of Knossos as well as the Byzantine era, whereas there are also elements of the Italian architectural legacy of the Dodecanese Islands. The Resort is built with natural materials while the dominant earthy colors allow it to blend uniquely in the surroundings. 238 rooms, of which 3 independent villas each with private pool, 3 suites each with private pool, 42 double rooms with a shared pool, 12 family rooms. 21 infinity pools, of which 6 private, three restaurants and two bars, two tennis courts, water sports (wind surfing, sailing, canoes, diving), mountain bikes, table tennis, beach volley. “Helona” is the greek name for “turtle”. “Helonas” are symbols of wellbeing and longevity. It is no wonder that we are so proud of our “Helona Wellness and Longevity Center”, where we offer an extensive range of beauty and relaxation treatments from Asia and Europe. The Center features a total of five treatment rooms including two VIP cabins, a special chromotherapy room, a double ayuverdic suite and a wet room with a floating bed. The Center also has a hamam, a sauna, a heated swimming pool (for adults only) and a fitness room,all with free access to our guests. Our Conference Center has three connecting Halls plus an extra adjoining Exhibition Area and a fully equipped Business Center at the same level. The Conference Center enjoys day light and has direct access outdoors. Full banquet services are offered for gala dinners, welcome receptions, coffee breaks etc.